I am now hopelessly addicted to two salads. I was busy posting about the Sesame Cilantro Vermicelli Salad, when Dana was posting about Quinoa with Grilled Zucchini, Chickpeas, and Cumin. I read the ingredients and how the spices get warmed in oil until fragrant and knew I was hooked---just-like-that! Add the fact that I had all of the ingredients on hand and know that this delight was on the dinner table, er belly by nightfall. I love Quinoa. It is so healthy and easy to prepare. Combined with zucchini and chick peas and you have got yourself a mighty fine complete meal, as is. So satisfying and beautiful as a stand alone, or if you must have more, serve it as a side. At dinnertime we ate it warm, but the next day, we ate it chilled, would you believe for breakfast? I know, without a doubt that a fried egg would be a wonderful addition. I am so glad Dana posted this recipe, check her post. Quinoa generally needs to be rinsed before using so it is not bitter. If you buy Bob’s Red Mill brand, it does not need to be rinsed. Combine chickpeas and lemon juice in a large bowl. Add 3 tbsp. oil; press in garlic and stir to combine. Let marinate at least 15 minutes and up to 2 hours. Heat 1 tbsp. oil in medium saucepan over medium-high heat. Add cumin seeds, 1/2 tsp. tumeric, and 1/2 tsp paprika; stir until fragrant, about 1 minute. Add 2 cups water, quinoa, and coarse salt; bring to simmer,stirring occasionally. Reduce heat to medium-low. Cover and simmer until all water is absorbed, about 20 minutes. Meanwhile, prepare barbecue (medium-high heat). Place zucchini on rimmed baking sheet. Drizzle with 1 tbsp. oil. Sprinkle with ground cumin, 1/2 tsp. tumeric, and 1/2 tsp. paprika. Toss to coat evenly. Place zucchini on grill; sprinkle generously with salt and pepper. Grill until tender and browned on all sides, 10-12 minutes. Transfer to work surface. Cut crosswise into 1/2-inch pieces. 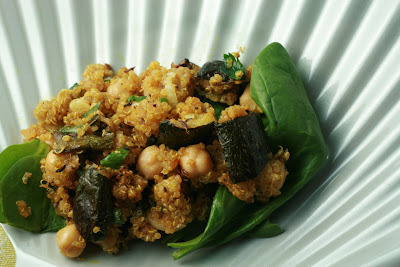 Add zucchini, green onions, and parsley, then chickpea mixture to quinoa. Toss to blend. Season to taste with salt and pepper. Looks just awesome! 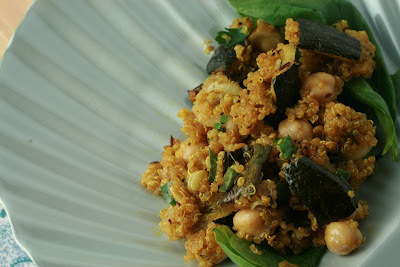 For all the quinoa doubters out there, try this recipe! There are limitless ways of cooking chicken. This http://wikichicken.com site shares a lot of chicken recipes and the most popular chicken dishes. I am speechless, me speechless?